The film, which features the voices of Will Ferrell, Brad Pitt and Tina Fey, took $30m (£18.6m), bringing its two-week haul to nearly $90m (£56m). Opening at number two was runaway train action thriller Unstoppable starring Denzel Washington and Chris Pine with $23.5m (£14.6m). Robert Downey Jr comedy Due Date fell one place to three. Among the weekend's other new releases, sci-fi thriller Skyline opened in fourth place with $11.7m (£7.3m) and Harrison Ford comedy Morning Glory rounded out the top five with $9.6m (£6m). Hollywood.com analyst Paul Dergarabedian said Megamind's success was due to it being a rare family film in the current cinema market. 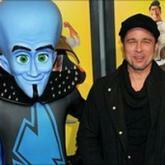 "Up until Megamind the marketplace was virtually devoid of any family films," he said. "The R-rated films were dominating - you had Paranormal Activity 2, Saw 3-D, 'Jackass 3D. Then there was a plethora of adult-oriented dramas." However next week sees the release of the highly anticipated Harry Potter and the Deathly Hallows, which is expected to knock Megamind from the top spot.